Thanks to the inelastic material, you can apply strong pressure without it being unpleasant, because the very firm material distributes the pressure over a wide area. The material’s high stability exerts a massage effect during movement, for example, when taking a stroll, which increases the blood circulation and promotes the return transport of lymph fluid to support the healing process. 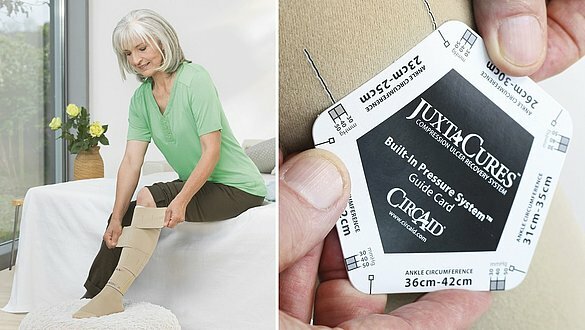 The inelastic circaid juxtacures compression garment should be worn all day – until the wound has healed. Alternatively, it is possible to wear the circaid juxtacures until the associated oedema has been decongested completely. You can switch to the visually discreet two component stocking system mediven ulcer kit until the wound has closed completely. Your doctor may prescribe reduced compression pressure for the night to extend your compression therapy to 24 hours. This compression can also be set and checked using the BPS card. The mediven ulcer kit consists of two components and is therefore simple to put on. mediven ulcer stockings have a comfortable pressure of 20 mmHg at the ankle. This enables the liner stocking to be worn at night as well, thus ensuring continuous compression around the clock. The second component, mediven ulcer plus, also has pressure at the ankle of 20 mmHg and serves to support and reinforce compression during the day or during the mobility phases. This guarantees the medically required compression pressure of 40 mmHg and high working pressure, above all during the acute phase of ulcer therapy. This second component, which is beige, also gives mediven ulcer plus a discreet look. 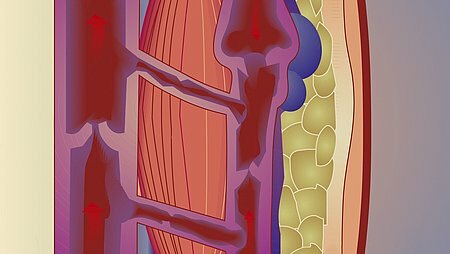 Watch out for the typical symptoms that can occasionally occur during compression therapy. circaid juxtacures should always feel firm, but still be comfortable. If you have an unpleasant feeling, pain or if your toes feel numb and cold, you should undo the straps immediately and apply them again with less compression. It may even be advisable to take off the compressive sock. However, in this case, please contact your therapist or doctor. If you put on and take off circaid juxtacures yourself, inspect your legs for any skin irritation or skin changes every time you take them off and contact your therapist or doctor if these occur. Make sure you avoid any injuries to your leg and foot because these can slow down therapy. It should be remembered that even after the wound has closed, the venous disease will still be there. So, to maintain the result of successful treatment in the long term and to prevent recurrence of the wound, you must keep wearing compression garments. Compression stockings are ideal for this. These are available in a wide variety of models. What makes mediven compression stockings so special? medi offers stockings for different demands in modern compression treatment and mediven compression stockings are matched to your needs down to the last detail. They are produced to a high-tech standard, are equipped with numerous feel-good properties and impress with their comfort in wear. The medical efficacy is achieved in a very pleasant way. Numerous variants and colours grant your every wish – it is even possible to refine them further with Swarovski® crystals*. medi creates high-quality brand quality with the plus for patients with venous disorders: the medi feel-good factor. 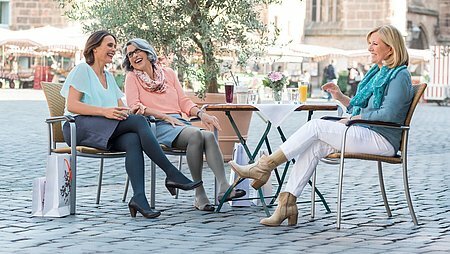 Click here for more information about our mediven compression stockings.